This area of the city bound by Dundas Street to the north and the Thames River to the south and Adelaide and Highbury to the east and west is one of the older neighbourhoods in the city, part of both the 1885 and 1912 annexations and shares much of its history with the neighbourhood of Old East. This area has the unfortunate distinction of having the lowest average property values in the city. In spite of that, this area encompasses one of London’s most notable icons, the Western Fairgrounds and Raceway. It is also home to the CN rail yard which cuts through the middle of this area. Along its southern edge, there is an extensive system of parks and bike paths. It also makes its contribution to the arts scene in the city by hosting Aeolian Hall. The Western Fair is an agricultural fair held annually in London, Ontario, in early September. The first Western Fair was held in September 1868 in downtown London, northeast of the current location of Victoria Park. Organizers had hoped to use the Crystal Palace Barracks as the main exhibition area. Livestock shows took place on the parade grounds outside the Crystal Palace. In 1887, when it gained legal status through the Provincial Charter and Act of Incorporation, it moved to 316 Rectory Street in east London, where the fairgrounds remain today. The present Fair Grounds were purchased for $65,000. Except for an eight-year period between 1939 and 1947 when the Canadian Department of National Defence occupied the grounds, the Western Fair has operated on the new site. The Western Fairgrounds are open all year and include facilities for hosting trade shows, the Western Fair Raceway, slot machines, an arena complex and an agricultural complex. The former IMAX theatre closed after nine years on November 30, 2005, due to low attendance. It was recently reopened as the London City Music Theatre after renovations. In 1882, The London East Town Council bought a plot of land and authorized the expenditure of $7,000 towards the construction of a town hall which was intended to thwart any annexation attempts by the City of London. It was designed by the famous architect George F. Durand and is a combination of High Victorian and Italianate design. The hall was constructed between September, 1883 and June 1884 and went over-budget by double the original estimate. East London was in severe financial trouble at this point and ended up amalgamating with the City of London in 1885. Since its construction, Aeolian Town Hall has seen a number of interesting uses. The Ninth Divisional Court was held here in the 1880’s and 1890’s. Around the turn of the twentieth century, outdoor concerts and plays were held in the evenings on stages and in tents behind the building. These events were often paid for by traveling herb doctors who used these occasions to give sales pitches on their so-called “cure-all” herbs. From 1888 to 1890 there was a branch public school at the Hall. In 1901, Samuel Francis Wood had a workshop at the Hall. At one time, a metal cast fountain stood on Dundas Street in front of this building. It had two metal spouts and chained cups and a bowl arrangement in the middle for horses and a small bowl at the base for dogs. On December 23, 1915 the London Public Library opened its first branch library, the East End Branch, on the ground floor front of this building. The Oddfellows Lodge held its meetings on the second floor of this building during the 1930’ and 1940’s. Goodwill Industries of London occupied part of the main floor from 1945 to 1947. From 1947 to 1982 a variety of retail businesses occupied the building. Meanwhile, in 1947, Gordon D. Jeffrey purchased the First Congregational Church and refurbished it as a concert hall renamed “Aeolian Hall”. He was one of the first Londoners to promote chamber music in London. The name has its roots in Roman mythology, as the God “Aeolus” is the keeper of the winds. There was at the time an Aeolian Hall in London, England and one in New York City as well. On May 20, 1968, the Aeolian Hall at 379 Dundas was destroyed by arson. In 1968, Mr. Jeffrey purchased the former London East Town Hall for $42,000 as a temporary headquarters until the original could be rebuilt as part of the London Towers complex at 379 Dundas. In 1969, the old town hall was refurbished as a fully equipped musical performance center. To improve the acoustics of the Hall, the original ceiling fastened to the base of the dark beams was removed. The original stage was raked, but the orchestra pit was added in hopes of staging small operas and musicals. On opening night in September 1969, Mr. Jeffery conducted the Aeolian Town Hall Orchestra in a program of three Brandenburg Concerti and the Violin Concerto in E Major by Bach. On October 12, 1972, the Historic Sites Committee of the London Public Library Board unveiled its thirteenth plaque at the Hall. In March 1977, Mr. Jeffery abandoned his plan of rebuilding the original Aeolian Hall, putting up for rent the 200’ long, 70’ high unfinished 400-seat hall located 20 floors above street level atop the north tower of the London Towers complex. It had huge windows offering spectacular views of London. Later that year the new Aeolian Town Hall hosted Theatre London which performed a reduced playbill under the directorship of William Hutt for its 1977-78 season while the Grand Theatre was under renovations. In 1989, the Forest City Gallery, the oldest artist-run gallery in the London region, moved into the building. The area is host to a number of parks including Queens Park, the CNRA Park, Silverwood Park and Silverwood Arena, Meredith Park, Maitland Street Park, Southbranch Bikeway, Vauxhaull Park and St. Julien Park. 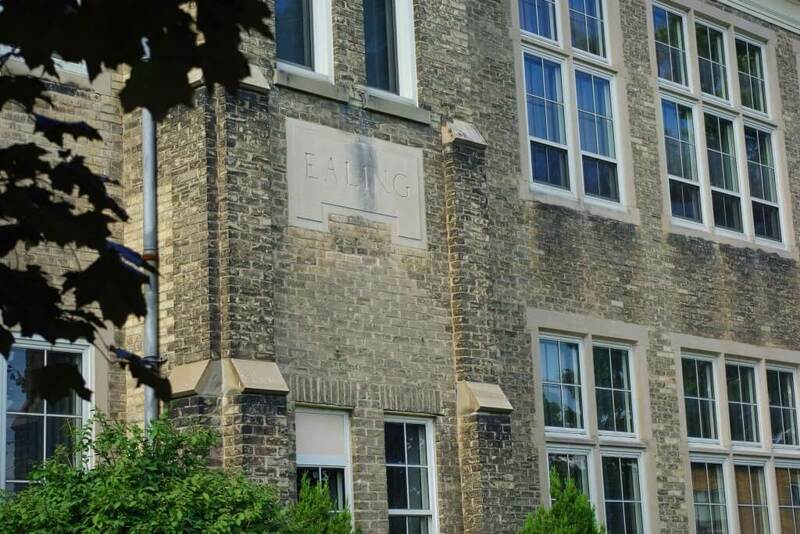 Elementary Schools include the St. Mary School Choir and Orchestra Program (Catholic), Trafalgar P.S., Ealing P.S., the LesterB. Pearson School for the Arts and Holy Cross Catholic School.